Confirmation of a diagnosis of rinderpest is based, first, on the demonstration of the presence of specific antigens in the tissues, excretions and secretions of suspect cases, second, and less commonly, on the isolation and identification of infectious rinderpest virus from the tissues, excretions and secretions, and, third, but rarely, on the detection of an increase in specific antibodies in the sera of suspect cases. It cannot be emphasized too strongly that a serological confirmation of rinderpest is not essential where the disease is enzootic or in countries where cattle are at risk because of geographical proximity or commercial livestock links with a country where the disease is enzootic. Any condition in cattle, buffaloes or other artiodactyls that clinically resembles rinderpest, even in a mild form, must be regarded as rinderpest and immediate steps should be taken to control and contain the outbreak as if it were rinderpest. The expense involved in instituting rinderpest control measures is negligible when compared with the potential losses if the steps to control the disease are delayed. If the outbreak proves not to be rinderpest, no harm has been done; if the true cause is another contagion, then the rinderpest control measures will have helped to contain it. In contrast, when a country embarks on the final stages of an eradication campaign, it is essential that all suspect outbreaks be speedily confirmed. Confirmation is usually legally required before the state authorities will pay compensation to a livestock owner. Consequently, a slaughter policy cannot be carried out until agreement on compensation has been reached. Speed is of the essence because failure to obliterate sporadic foci confounds eradication. Similarly, rinderpest-like diseases in the livestock of low-risk countries should be confirmed or refuted as quickly as possible. Unfortunately, a diagnosis of rinderpest in a low-risk country will more than likely be delayed unless there is a known livestock link with a high-risk or enzootically affected country. In particular, the fatal, fulminating mucosal disease syndrome of bovine virus diarrhoea virus infection closely resembles rinderpest and is known wherever cattle are kept. The first presumptive diagnosis of an outbreak of rinderpest in a low-risk country, therefore, will probably be wrong. The key to diagnostic success is the examination of suitable samples from several sick animals rather than of many samples from one animal. The crucial factor is the selection of suitable donor animals. Natural rinderpest infections develop when susceptible animals are exposed to aerosols generated by infected animals .Virus in the aerosol invades the tissues of the new host through the mucous membranes lining the conjunctival sacs and upper respiratory tract and multiplies in the tonsils and associated lymph nodes. The virus is then disseminated in the blood attached to mononuclear cells, infecting other lymphoid tissues, the lungs and mucous membranes of the alimentary, respiratory and urogenital tracts and multiplying there. New virus is first shed in the excretions and secretions of the infected animal towards the end of the incubation period, before the onset of illness. It continues to be shed throughout the prodromal fever, the erosive-mucosa phase and the diarrhoeic phase. Shedding of virus stops in early convalescence, a few days after the fever has regressed. In practical terms, there is no prolonged carrier state. 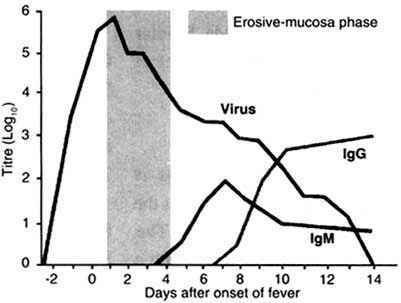 The infectious period, therefore, lasts from ten to 16 days at most. 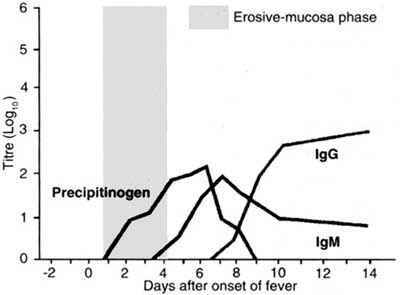 The optimal period for collecting suitable diagnostic specimens is much shorter, however, because viral titres peak before or at the onset of fever, antigens peak early in the erosive-mucosa phase and precipitinogens detectable by agar-gel immunodiffusion peak later in the erosive-mucosa phase. Thereafter, titres of infectious virus and antigens decline exponentially (see Figure 10). Consequently, dead animals, most of whom die between six and 12 days after the onset of illness, are poor donors of diagnostic samples and are best avoided. Similarly, animals distressed by mucopurulent nasal and ocular discharges and soiled animals voiding fetid, fluid faeces are less likely to yield positive diagnostic samples. In short, suitable live donors of samples for virus isolation or antigen detection are febrile, have mucosal erosions and clear lacrimal secretions. Animals that die from cardiogenic shock in the prodromal and erosive-mucosa phases of the disease are rich in infectious virus and antigens; these are, therefore, good donors of diagnostic specimens. They can be identified by extensive subendocardial haemorrhages in the left ventricle of the heart and by subepicardial petechiae on the base of the heart and along the coronary grooves. In marked contrast, animals whose autopsies reveal extensive pulmonary emphysema have died late in the course of the disease. Such animals contain little, if any, infectious virus and antigens. 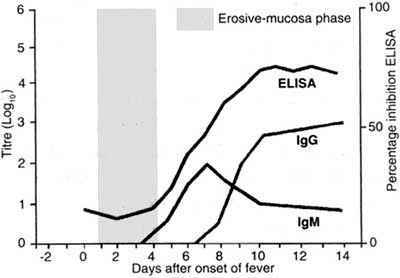 The first rinderpest-specific humoral antibodies belong to the IgM class of immunoglobulins and emerge towards the end of the erosive-mucosa phase or in the early diarrhoeic phase of the disease. A few days later, rinderpest-specific antibodies are also found in the IgA and IgG classes of immunoglobulins. The early IgM-class antibodies wane relatively quickly, whereas the IgA- and IgG-class antibodies persist. Serum donors, therefore, should be selected from still febrile animals showing early signs of the onset of diarrhoea. The donors should be identified indelibly so that they can be bled again for serum two to three weeks later while convalescing. The specimens required for diagnosis from the selected live animals are samples of peripheral lymph nodes, gum debris, tears, blood in anticoagulant and clotted blood All tissue samples or gum debris should be kept chilled, and transport medium (PBSA containing antibiotics and fungizone, but no glycerol) may be added to help preserve the specimens. For virus isolation, samples should be transported as quickly as possible chilled but not frozen. If samples are to be stored for long periods, they should be frozen at-70°C and not-20°C. A peripheral lymph node is located and grasped firmly through the skin. A wide-bore needle with its stylet in place is thrust into the parenchyma of the node. The stylet is removed and a 10- or 20-ml syringe, pre-wetted with a drop of Heparin Injection BP, is attached to the needle. A plug of tissue is aspirated into the syringe by pulling on the plunger and is injected into a suitable container, a small Ten-Broeck tissue grinder or the well of an agar-gel immunodiffusion plate or slide. Similar samples may be collected into 0.5 to 1 ml of transport medium for molecular studies. The necrotic debris coating eroded gums is collected on a spatula or finger rubbed across the gums and inside the lower and upper lips. The debris is scraped off the spatula or finger into a convenient container. Samples for molecular studies should be collected into 0.5 to 1 ml of PBSA. Clear tears are absorbed on to cotton buds or swabs inserted into and twirled around the conjunctival sac behind the eyelids (see Figure 11). The bud or swab is broken off into the barrel of a sterile 2-ml syringe and 150 m l of PBSA is added. Using the plunger, the drops of fluid are squeezed out into a suitable container. Further eye swabs should be collected for molecular studies; in this case, however, the tip of the swab should be cut off and immersed in 0.5 to 1 ml of PBSA. Blood is collected into sterile containers containing a suitable anticoagulant such as ethylenediamine tetra-acetic acid (EDTA) or heparin. The container is gently agitated as soon as it is filled in order to discourage clotting. Samples should be stored and transported chilled but not frozen. 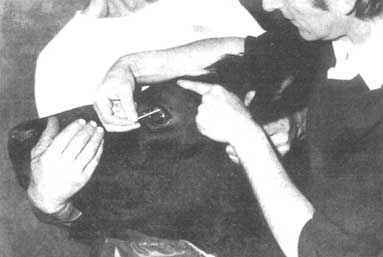 It is essential that a fresh hypodermic needle is used for each animal sampled. The technique is vastly simpler and immeasurably improved if commercially available evacuated blood-collection tubes are used with small-bore disposable needles. These allow samples to be withdrawn from the tail vein as well as from the jugular vein. Blood for serum is collected into plain, sterile containers, preferably silicone-coated, and allowed to clot undisturbed for a period of at least 24 hours. Storage and transport conditions are the same as those mentioned under "Biopsies" above. 1. Select the slaughter site carefully to avoid contaminating the carcass, organs and tissues. 2. Stun, pith, exsanguinate and autopsy the selected animals. 3. Remove the spleen and cut it into strips sufficient to fill three labelled and chilled 30-ml screw-capped bottles. Identify the bottles and push them immediately into wet ice in an insulated box or flask. Simultaneously, cut thin slices of the spleen and immerse them in formol saline for histopathological examination. 4. Using similar sterile precautions, collect enough carcass lymph nodes, particularly mesenteric lymph nodes, to fill three labelled and chilled screw-capped bottles. Identify the bottles and place them in the wet ice. As before, cut thin slices for fixation in formol saline as well. 5. Dissect out as much tonsillar tissue as possible and distribute aliquots among three labelled and chilled screw-capped bottles, which should then be identified and inserted into the wet-ice container. 6. Fix thin slices of tonsillar tissue in formol saline. Samples of affected mucosae in the alimentary, respiratory and urogenital tracts should also be fixed in formol saline. Where possible, all dead animals should be autopsied. Fresh, clean carcasses of animals that have died early in the course of the disease are worth sampling by collecting aliquots of spleen, lymph nodes and tonsils for antigen-detection tests. Slices of these tissues together with portions of affected mucosae should also be fixed in formol saline for histopathological examination. Fresh animals that have died late in the disease are soiled and fetid and usually emaciated. They should be examined to supplement the clinical findings, but their tissues should only be collected for histopathology. Decomposed animals are not worth examining. 1. Examine the whole herd or flock and select at least six animals in the early acute stage of the disease. 2. Collect the appropriate samples from each animal and then kill two for visceral specimens. 3. Autopsy all dead animals, unless they are decomposed, and collect appropriate samples from animals dying from cardiogenic shock. 4. Mobile rinderpest surveillance teams should be provided with the necessary equipment to run counterimmunoelectrophoresis (CIEP) and agar-gel immunodiffusion (AGID) tests at the site of the outbreak in the field. 5. Field staff should take the specimens to the nearest district veterinary laboratory to run CIEP, AGID, immunofluorescence (IP) and immunoperoxidase (IPS) and immunocapture ELISA tests. 6. Virus isolation and histopathology are carried out by the central veterinary laboratory, which is also charged with the essential task of preparing, testing and distributing rinderpest diagnostic reagents to the district veterinary laboratories and to the mobile rinderpest surveillance teams. 7. Samples should be sent to the FAO World Reference Laboratory for Rinderpest at the Institute for Animal Health, Pirbright Laboratory, Surrey, United Kingdom, for confirmatory diagnosis, PCR and molecular epidemiology studies. Considerable time and effort is expended in collecting field samples and a similar commitment is made by laboratory staff in carrying out diagnostic attempts. It is therefore important that the specimens arrive at the handling laboratory in as good a condition as can be reasonably achieved. This short chapter looks at ways in which this aim can best be met by combining the basic principles of speedy of transportation, shipment without spillage and accurate temperature control .At the same time it must be recognized that not all specimens require the same treatment and that handling will vary depending on whether the specimen is fixed tissue or serum and on whether it will be used for antigen demonstration or virus isolation. Most samples will be handled at a national reference laboratory, but it is also necessary to consider the shipment of samples to regional reference laboratories. It is generally a veterinary officer working out of a veterinary investigation centre who first collects the specimens and who is responsible for making decisions regarding their handling. Although an equipment list is difficult to specify in detail, it is assumed that the officer has access to a refrigerator, a domestic freezer capable of running at -20°C, a supply of ice, a wide-mouthed Thermos flask, knives, scissors, forceps and containers for collecting specimens. A supply of formol saline for fixing tissues and evacuated bleeding tubes for the collection of serum is also needed. At times specimens may be obtained from animals presented at the investigation centre, but more often the officer will be called into the field and may have to look after samples for some time before returning to the laboratory. Sample bottles must be labelled clearly in waterproof ink on good-quality adhesive tape; this should be done at the time of collection, together with the writing of comprehensive field notes. Tissues placed in fixative require no further care other than ensuring that screw-caps are tightly in place and that gross overheating does not occur. Blood samples for serum should be allowed to clot for about two hours in the shade or at room temperature, after which they should be inspected to ensure that the clot is free from the wall of the tube and that serum is forming. A sharp tap against the heel of the hand will do this if required. If the team is moving rapidly from place to place, the tubes can be loaded into a vehicle as soon as they have been collected. The vibration of movement will usually free the clot shortly after it has formed. If the laboratory is reached on the day of collection, blood samples can be placed in the refrigerator until the next day. If touring, the samples should be placed on ice in the Thermos flask or in any available refrigerator. If the samples are kept cool, haemolysis is not usually a problem and good serum can be obtained four or five days after collection. In the laboratory, the serum should be clarified by centrifugation at 1 000 g for ten minutes. The serum can then be stored indefinitely in clean screw-capped bottles at -20°C or, if a freezer is not available, for several weeks at 4°C. If sick animals are seen, eye swabs will have been collected for the detection of antigen together with samples of blood in EDTA or blood in heparin. If a post-mortem examination has been undertaken, samples of spleen and lymph node will have been collected. All these specimens should remain chilled on ice until they are returned to the laboratory. Transport medium is not strictly necessary for transporting solid tissues, as these contain sufficient protein to protect the virus and are not amenable to buffering. However, a small amount of phosphate-buffered saline (PBS) with high levels of antibiotics and a fungistat may be added to combat surface contamination and dehydration. Glycerol should not be included because it is virucidal for rinderpest virus. In the laboratory, blood for virus isolation or solid tissue samples should be placed at 4°C, while swabs for antigen can be held at either 4°C or -20°C. While it may be possible to undertake antigen detection tests at the veterinary investigation centre, in general it can be anticipated that samples must now be sent to a national reference laboratory within the country of origin. Here the prime considerations will be temperature, speed and method of transportation. It will generally be possible to telephone or fax the reference laboratory to alert staff that field material is about to arrive. Specimens should be sent either by road or by internal air services. By road, the choice usually lies between transport supplied by the veterinary investigation centre and a reliable bus service. Fixed specimens should be packed in a cardboard box and dispatched at ambient temperature. Serum samples that have been frozen can be placed in a Thermos flask and packed tightly with paper towelling or cotton wool. They will remain frozen for several hours and can withstand a journey of at least 24 hours unharmed. Antigen specimens can be packed alongside the serum. Blood for virus isolation and solid tissues should be packed with melting ice in a separate flask. If only a few serum or antigen samples have to be sent, these can be thawed from -20°C and included with the blood and tissues. Documentation should be attached to the flask. From time to time, the national laboratory may wish to submit samples to the regional reference laboratories .The only satisfactory way of sending such specimens is by air freight, which, although expensive, is quick and reliable. Postal services should not be used. International Air Transport Association (IATA) regulations require that specimens be placed in a primary receptacle, i.e. a blood tube or a screw-capped bottle, surrounded by sufficient absorbent material (such as cotton wool) so that in the event of breakage the fluid contents of the primary container will be retained within the secondary packaging. The secondary packaging must then be enclosed in a strong tertiary (outer) packaging. Perishable specimens should be shipped under the conditions specified above except that here the wide-mouthed Thermos flask becomes the tertiary packaging; specimens must be wrapped in absorbent material and placed in a sealed tin within the Thermos. Fixed specimens should be boxed in wood. As before, documentation should accompany the specimens. In addition, a telex or fax should be sent to the reference laboratory giving the name of the carrier, the flight number and the air waybill number. In this way, the package will remain safely in the hands of customs officers and can only be cleared by the laboratory in question (see Figures 13 and 14). After either national or international movement, specimens should only be opened in a microbiological safety cabinet. This protects staff and samples from inadvertent contamination. All packaging materials should be burnt. Disinfected containers may be returned to the laboratory.